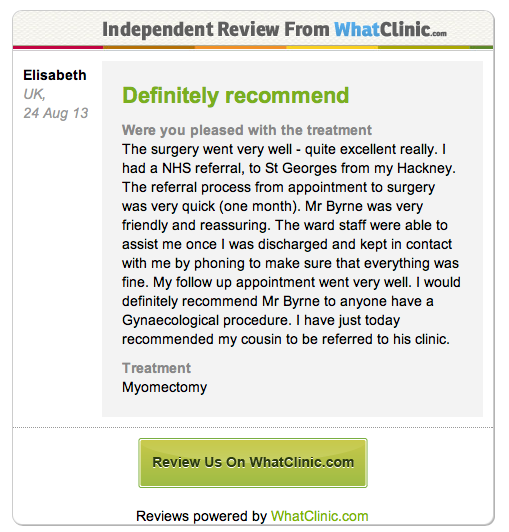 I am a London based consultant obstetrician and gynaecologist working in both the NHS and private sectors. I have a busy NHS practice at St George's Hospital, London, where I specialise in the treatment of fibroids and endometriosis as well as many other gynaecological conditions. I offer private consultations and outpatient treatment at the Chelsea Outpatient Centre on the Kings Road, London on Friday mornings and I also see patients at the Lister Hospital on Tuesday evenings. Most surgical procedures and admissions take place at The Lister Hospital. I try to offer a practical and sensible approach to gynaecological problems and issues, and I do not like to offer unnecessary investigations or procedures. I am conscious of the long and short term time constraints that women have in their lives. I am a member of several societies to ensure that my practice is peer reviewed and up to date. I have published numerous research papers and I also present my team's research work and audits at international conferences on a regular basis. My undergraduate training as a doctor was in Dublin and my specialist training as an obstetrician and gynaecologist took place in major London Hospitals including the Chelsea and Westminster Hospital and Queen Charlotte's. My laparoscopic surgical skills were gained at St Mary's Hospital, Paddington. I also undertook a fellowship in further laparoscopic surgery in Strasbourg, France and my research into endometriosis was carried out at St Bartholomew's Hospital in London. "I try to offer a practical and sensible approach to gynaecological problems and issues, and I do not like to offer unnecessary investigations or procedures. I am conscious of the long and short term time constraints that women have in their lives"
I contribute to Talkhealth's online clinics on women's health issues.